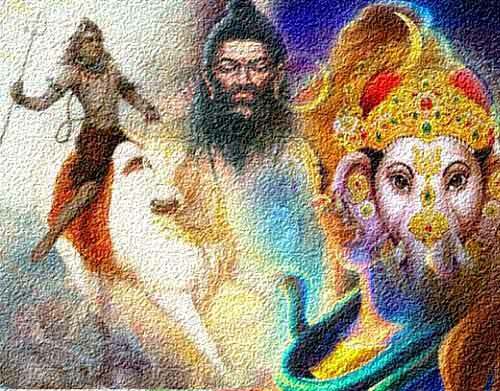 There are numerous stories that attempts to explain as to how Ganesha got the elephant head. One such story is associated with Gajasura and Shiva. Gajasura was an ardent devotee of Shiva. He performed intense austerities and performed Tapas for several years. Finally, the harsh penance of Gajasura pleased Shiva who promised him a boon. The demon requested Shiva to stay in his stomach. Lord Shiva is also Bholenath and he agreed to the wish of his devotee. Goddess Parvati was devastated and he sought the help of Lord Vishnu. Mother Goddess Parvati and Lord Vishnu stitched together a plan. Vishnu disguised as a musician, Brahma became a tabla player and Nandi became the dancing bull. Together they performed before Gajasura. The dance of Nandi impressed so much Gajasura that he offered him anything he wanted. Gajasura agreed even though he knew that this meant his death. Pleased with his Dharma, Vishnu and Brahma asked him what boon he wanted, he told the gods that he wanted his gajamukha, or elephant face, to be never forgotten by people and everyone should worship it. The gods gave the boon and when Maa Parvati had a son, he was given the head of Gajasura.